You’ve possibly seen this simple demonstration in your physics class in high school. The teacher grabs a large ball and a small one; the smaller, lighter ball is placed right on top of the heavier, larger one, and the pair are dropped together. The heavier ball hits the ground and bounces a little bit, but the lighter ball flies high into the air. At the time it was only mildly impressive, but you were watching the physics behind the most spectacular explosions the universe has to offer. 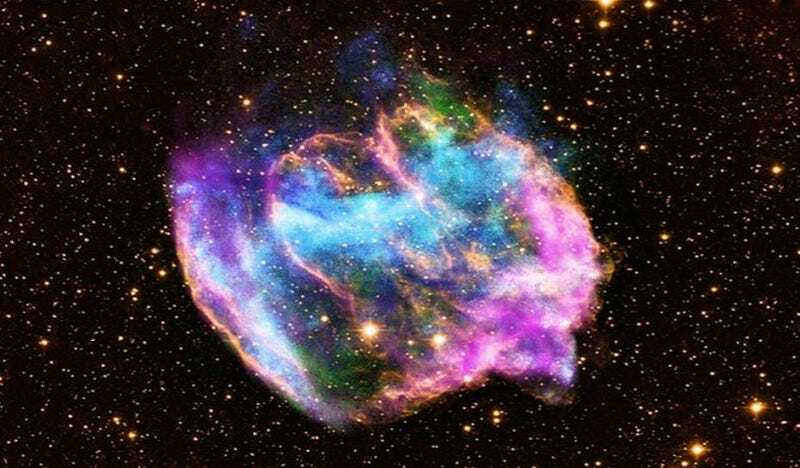 Supernovae work the same way that the balls do. Stars are kept burning by the fusion of atoms in their core, and the heavier the atoms that are being fused together, the bigger the star gets. Fusion of heavy atoms generally puts out a lot of heat, and the less-dense layers of the star, on the outside, are puffed outwards. This goes on until the star starts fusing elements heavier than iron. Up until that point, fusing atoms puts out more heat than it consumes. Fusing elements heavier than iron makes for an endothermic reaction – one that requires more heat than it gives out. The star that has spent so long being pushed outwards is suddenly without support. The entire thing collapses inwards, its lighter outer layers resting on its heavier layers as they fall. The inner layers of the star bounce, just like the heavier, denser ball; they push against the outer layers and seem to settle a bit. What happens then, in both cases, is a transfer of momentum. The inner, heavy layers have a tremendous amount of momentum, and when all that momentum is transferred to the light outer layer, or the light upper ball, the lighter layer goes jetting outward. Whether it’s in a physics classroom or out in the farthest reaches of space, the principle is the same.